When it comes to diversifying a portfolio, many professional advisers follow Noah’s approach by including two of every type of fund in client portfolios. At best, you end up with a crowded ark. At worst, you end up with a lot of extra costs not directly visible to most investors that translate into underperformance. There’s a better, simpler way. Let’s begin by understanding the real cost of owning any mutual fund, but particularly one that is actively managed. Transactions costs – which includes brokerage commissions, market impact costs and spread costs of the securities transactions inside the fund. Tax costs – which are the taxes payable on capital gains in mutual funds that are owned outside of an IRA, Roth IRA, 401(k), or some other type of tax-deferred account. Moreover, an investor who buys into a mutual fund that is holding stocks with unrealized gains runs the risk of paying taxes when the gains are realized, even if the investor did not benefit from the stocks’ gains. Cash drag – which is the result of a manager’s need to maintain liquidity to fund potential transactions and potential redemptions rather than being fully invested at all times. Essentially, buy and hold investors are subsidizing other investors’ liquidity needs. Soft dollar costs – are a quid pro quo arrangement on Wall Street and are incurred when a mutual fund manager directs premium rate commissions to brokers who provide research and/or other services for free that the manager would otherwise be obligated to pay for on its own. A number of academic and industry studies quantify these costs, and we don’t need to quibble over whether they are closer to an additional annual cost of 1% or 2% (or some other number, lower or higher) to make the essential point: The cost is non-zero. Here’s another way to think about it: What if instead of paying an all-inclusive headline price of $19.99 for an all-you-can-eat buffet, when you went to check out the cashier told you that there was also a small 20-cent charge for each different item on the plate (that was in the fine print of the offer)? Sure, it was there, but you never paid attention to it. When it comes to building a portfolio, there’s a simpler solution to achieve true diversification. For the equity portion of your portfolio, you need to own only two mutual funds to be fully diversified. You may own other equity securities or funds for other reasons, but they can’t add anything to the diversification inherent in a portfolio that effectively represents the equity market as a whole. Based on the holdings of these two funds as of July 31, 2016, collectively you would own shares in 9,676 of the leading businesses of the world. May we round it to 10,000? To be sure, this is not a discussion about active vs. passive management—which we’ll revisit another day. Instead, this is an argument in favor of owning two—and only two—mutual funds as your core equity holding to achieve true diversification. One covers domestic stocks, and the other international stocks. Pick whatever ratio you want (75% domestic and 25% international, as a simple illustration, but certainly not as a specific or implied recommendation). But what you end up with is a beautifully diversified portfolio of nearly 10,000 of the largest public companies on the planet with tiny expense ratios and negligible hidden costs. Before we close, let’s revisit our friend Noah for some important behavioral lessons. 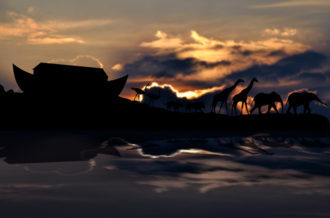 In preparation for the flood, how many animals of each kind did Noah take onto the ark? The answer that instantly springs to mind, of course, is two. “You shall take with you seven each of every clean animal, a male and his female; two each of animals that are unclean, a male and his female; also seven each of birds of the air, male and female, to keep the species alive on the face of all the earth” (Genesis 7:2-3). We’ll leave it to the biblical scholars to debate whether the animals boarded the arks in groups of two or seven, but nearly all of us have “Noah’s ark = two of each type of animal” hard-wired into our brains. That same hard wiring comes into play in how investors think about fund diversification. For them, two mutual funds often are too few. When it comes to portfolio diversification, the availability heuristic—the mind’s method of providing instant recall—tells us that more is better when it comes to diversification. This is false when creating an equity portfolio out of mutual funds. Noah may have wanted two of each species, but for your portfolio, a total of two is enough.